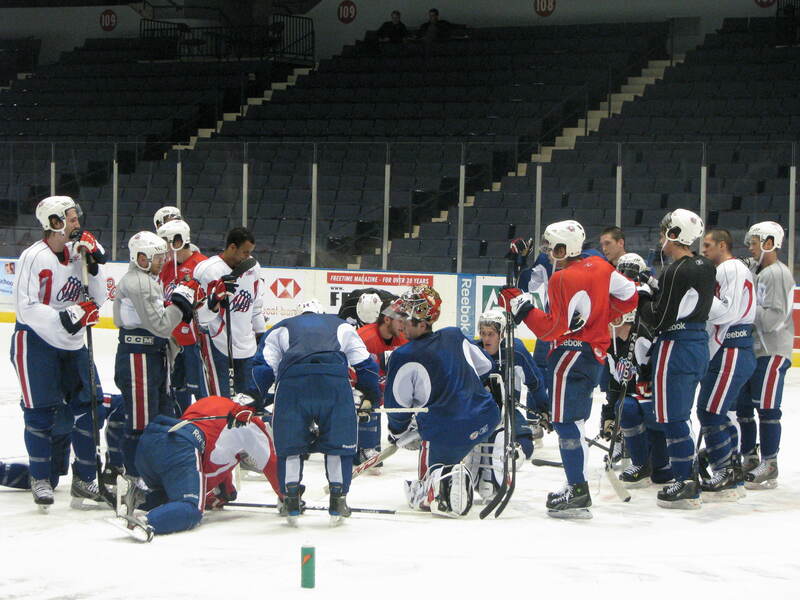 Amerks' Monday Morning Workout · Let's Go Amerks! The team was schedule to have practice this morning at 11am, a better term would be that the team had a workout. They spent 58 minutes on the ice without a single puck. Benoit Groulx wasn’t kidding after Fridays game when he said that the team whole lot worse on Monday. The only time Groulx addressed the players directly was to tell them to do push ups. The last drill involved the players doing sprints from side to side followed by push ups. One player stood out that appeared to have no issues leaving the ice, and that was Mike Duco. Was going to take close pictures, but a courteous head shake from a player gave me the hint that it was not the time or place. As practice ended the team was told to hit the gym this afternoon and be back on the ice at 4pm. Whether they’ll practice with pucks, or get worked even harder is not known. Whether it was that or something else, Rory Fitzpatrick was not happy leaving the ice as he slammed his stick against the boards and tossed it into section 123. Before they all left the ice everyone gathered around center ice, in the middle was David Shantz who said a few words to everyone. Not sure what was said as I ran out of time this morning, but we’ll try and find out. Aside from Jacob Micflickier who is with the Florida Everblades, it appears that Drew Larman is injured as he was not on the ice.